Nearing the end of September I thought I would once again fill you in on some of the game updates over the last couple months. We’ve had a slight resurgence in coder support, which is always nice and so have been seeing both code and world building efforts making their way into the game. Some of these changes have been live for a month or two now, while others were surprisingly finished a few hours ago. Some of us like to surprise. Also, remember next month is Halloween and you can expect the annual festivities to commence in a few weeks and after that we’ll have our 20th Anniversary coming a week before the release of Episode VII. Like normal I also want to point you to our facebook page should you want to keep current with game. Now, on with the update! Play Now! As noted in our previous post, the website Online Client for playing the game from our website is now live. Workbenches have been fixed up. Partially a bug fix, the Evaluate command was serving double duty as both an object “look closely at” command and for studying details about a possible custom created item. We have removed this tie and replaced the Evaluate command with Assay, which can now be used to review what item your inventory items could produce. Reminder you can “look” at a workbench to see a list of available commands. The Chancellor Palpatine Surgical Reconstruction Center (ChanPal SuRecon) has been constructed. This is a 50 room expansion on Coruscant and in the same level range as the general zone (20-45) and includes medical services. Taxi’s have been given directions to the tower or you can find the landing platform yourself. 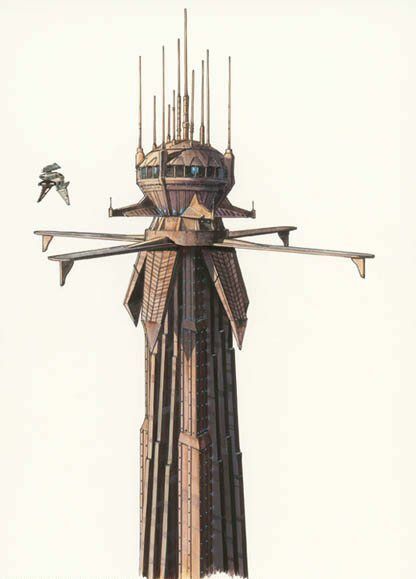 Well versed Star Wars fans will recognize this tower and it should be noted this expansion is only the safer, more public and visible portion of a far more dangerous (and awesome) zone we hope to include at a later date. Afterburner messages have been corrected. Evaluate will now appropriately disclose the size of a hull. Fixed the problem with Space Scan not working when the player also had the Walker Operator Scan skill. Corrected the Vehicle Level 70 experience cost gain amount. It was erroneously set to high. Jedi Sentinel’s can no longer be the recipient of Fury (Antisanct). The Wampa combat message no longer copies the Gore combat message.